The writer/director David France has followed his first excellent feature documentary the Oscar nominated How To Survive a Plague with another look back at an often forgotten part of LGBT history. 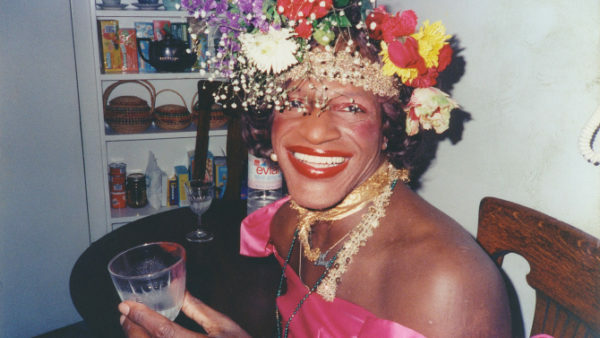 It is the story of Marsha P Johnson a veteran drag queen and gay liberation activist who suddenly was mysteriously found dead not long after she took part in the Stonewall riots, and whose death was written off by a disinterested police force as suicide. Now some 25 years later Victoria Cruz a transgender activist who is about to retire from New York’s LGBT Anti-Violence Project has chosen to investigate the case herself hoping to finally be able to get some closure on the incident for the family and community at last. Cruz has her own history of being assaulted and this helps propel her dogged research despite being unable to still get any co-operation from the now retired police officers who resent her digging up the past that they would rather forget. She has much better luck with the few friends who are still alive but at best their memories are now rather sketchy, although each and every one of them are convinced that Johnson had most definitely not taken her own life. France combines this with some excellent archival footage that paints a vivid picture of the flamboyant Johnson who was a much loved figure on the streets around Greenwich Village. Funny and fearless, this self styled ‘street queen’ herself had been was interviewed talking about being part of the crowd the infamous night that the Mafia owned Stonewall Bar was raided, and when for once the drag queens and transvestites fought back. However even though they played such an integral part of this important kick-start to the gay liberation movement, they still felt very marginalized by most of the gay community. When Johnson met the younger Sylvia Rivera a fellow activist they started S.T.A.R. (Street Transvestites Action Revolutionaries) which was essentially a housing program for other young women of color like themselves. Rivera was the most voluble in protesting against the authorities after Johnson’s death was literally swept under the carpet. Right until her own death ten years later the very politicized Rivera never eased up on trying to get better rights for drag queens and trans women and inclusion in the LGBT community, even though she faced a great deal of resentment and resistance from gay men in particular. As Cruz slowly pieces together witnesses statement to get a fuller picture of the case, she is also following the current trial in the homicide of Islan Nettles, the last in a long seemingly unending list of young trans women who had been murdered. Her killer James Dixon was claiming he committed the act in a “blind fury” after he discovered Nettles was trans, and was only sentenced to 12 years in jail. What follows is an interesting conversation between Cruz and one of her colleagues at the Anti- Violence Project bemoaning the lack of their resources that they cannot deal with all the new cases, let alone looking back into the past. Cruz agrees but is firm ‘They’re yelling out from their graves for justice” and continue to work diligently to collate another evidence to warrant an official re-investigation. The documentary not only quite rightly will help ensure that the legacy of Johnson, and Rivera too, are not forgotten and the crucial part they played in establishing the very early rights on everyone on the whole transgender spectrum is there on record for future generations to know and appreciate. By paralleling it with the Islan Nettle’s murder sharply reminds us that on many levels the safety of trans women has hardly improved at all and needs all our attention. And also very sadly the documentary served as an uncomfortable reminder that the LGBT community is still too factionalized, and that inclusion of transgender (the T part of LGBT) still has a long way to go. As for closure for Marsha Johnson, the final scenes in the film are of Cruz handing in a big folder with all her research to the FBI. Maybe what happens next will be France’s next film, either way, this one, like How To Survive a Plaque, should be compulsory for all our community no matter which letter of LGBT that you are.